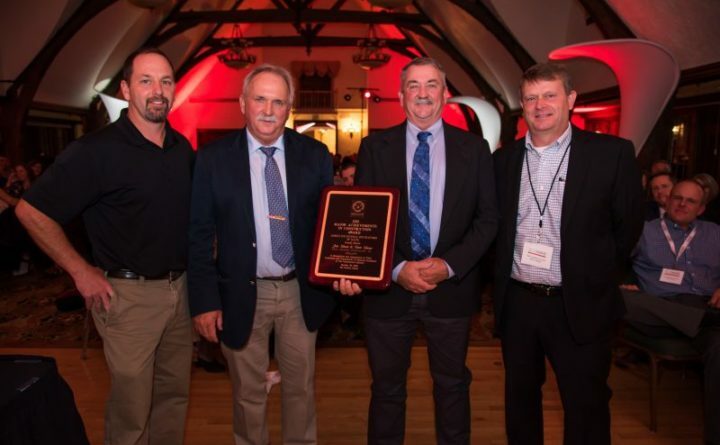 BAR HARBOR — Nearly 200 contractors recently gathered in Bar Harbor to celebrate AGC Maine’s Major Achievement in Construction Award winners Jon Shaw and Dan Shaw. The Gorham Brothers started Shaw Brothers construction in 1977 and have grown the company to one of the largest in New England. Their constant communication between each other has been critical to their success. Both started work early in life on their family farm and worked for their father DeWayne, a homebuilder and entrepreneur. They would get up before school and help get crews moving and return after school to wrap up work for the day. When it snowed, Jon Shaw would plow more than 60 driveways and commercial lots before heading to school for the morning. The Major Achievement in Construction Award was first presented in 1975 to Cianbro co-founder Ival “Bud” Cianchette. The honor is bestowed on someone who either affects construction in a substantive way with a single action or has provided a significant contribution to the construction community by nature of growing their business and being engaged for the betterment of the entire industry. “Jon and Dan are not only moving the earth, but they also are changing the landscape of the construction industry. Because of their contagious energy and the pace they set, tackling any issue they easily build momentum for creating change.That benefits the entire industry and our state,” said AGC Maine Board President Jon Smith of Great Falls Construction. Giving back to the community has been routine for Shaw Brothers. Dan has served on the board of Camp Sunshine, and both have been involved since 1990. They have donated to dozens of local causes including preserving land and recreation areas in Gorham with Shaw Park, and this year protecting more than 250 acres of land to be used as trails and farming adjacent to Route 25. The brothers believe that Maine must preserve their farming heritage and teach the next generation the value of growing food locally. “The people of Gorham are true Maine; hard working, you look out for your neighbor, take care of each other. It is people like Shaw Brothers that continue to feed that and the fact that they chose Gorham as their headquarters and stayed here is a testament to their commitment to our town,” according to Cindy Hazelton, Gorham Recreation Department director. Shaw Brother’s growth has been tremendous during their 41 years in business. They’ve completed more than 800 commercial construction projects, employ 250 skilled construction workers and have 125 years of aggregates that includes 14 gravel pits with more than 1,300 DEP permitted acres and 20 types of aggregate products. In 2008 the brothers purchased Commercial Paving, a small paving firm in Scarborough. That allowed them to test the market with a plant producing nearly 80,000 tons of asphalt each year. As the market continued on the path to more paving work, the two invested in the newest technology on the market a 400 ton per hour Astec drum plant at their Gorham office. The plant includes four 200 ton silos, eight cold feed bins,three rap bins, and is permitted to operate twenty-four hours a day. Shaw Brothers have installed a new Telsmith Crushing Plant in Gorham, Maine. The plant was built on a new 37-acre paved site to reduce cross-contamination and contains 4,099 feet of conveyors. The extensive conveyor system will reduce emissions from trucking and loading equipment and can stockpile over ½ a million yards of various stone and gravel sizes. The Associated General Contractors of Maine, chartered in 1951, is headquartered in Augusta and has members statewide. Member companies include general contractors, sub-contractors, and service and supply, providers. For information, visit www.agcmaine.org.